Home F1 Features So much for being free to race, eh Ferrari? First they said Sebastian Vettel was the “priority”, then they said the drivers are “free to race”, but unfortunately Ferrari stood by that first statement at the Chinese Grand Prix. For the third time this season, and let me remind you we’ve only had three races, Ferrari issued team orders in Shanghai in favour of four-time World Champion Vettel. 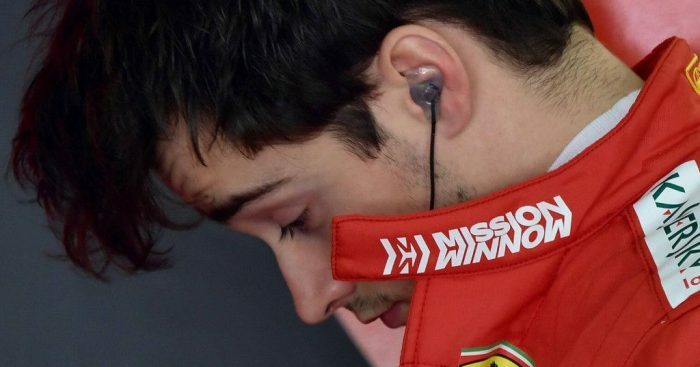 Leclerc wasn’t impressed and although he eventually moved over for his team-mate, he made it known that he was losing time behind Vettel who wasn’t able to race away from him. “I’m losing a lot of time. I don’t know whether you watching it or not. Just to let you know,” he said. And all the while Max Verstappen was catching the Ferraris prompting Red Bull to pit their driver first for fresh rubber giving him an advantage. Had Ferrari not switched the drivers around, the undercut that allowed Verstappen to take a position off Leclerc would have been far less effective. While Vettel finished the grand prix in third place, Leclerc’s afternoon was compromised with even a B-plan of running him longer than his rivals so that he had fresher tyres at the end was not enough to allow him to challenge for fourth. Instead of a 3-4 finish, Ferrari limped home 3-5. Leclerc lost two points, so did Ferrari. So while Mercedes are racing into the distance with a near perfect score of 130, short of only two fastest lap points, Ferrari after three races have just 73. Despite the obvious strategy error, Ferrari doubled down on their belief they did the right thing. “It’s difficult as a team to give the order because we understand the drivers’ need to battle to stay ahead as much as they can,” team boss Mattia Binotto explained on Sunday night. Ferrari’s rivals have weighed in on the situation with Mercedes motorsport boss Toto Wolff fearing the Scuderia have set a bad precedent whereby the driver running second can complain that his team-mate is holding him up. But the really disappointing part in all this, at least for the non-Vettel fan, is that Ferrari are ruining Formula 1 as Leclerc v Vettel is shaping up to the most intense and evenly matched team-mate battle on the grid. Mattia Binotto has gone back on what he said at the launch – Vettel and Leclerc are now apparently free to race. Yet not once have they allowed them to do that. Any time they have come to close to one another, Ferrari have intervened – and every time it has been in Vettel’s favour. It’s no wonder Leclerc wasn’t charmed on Sunday. Even though the Ferrari rookie moved over, he made it abundantly clear that he was not happy with the situation. On the back of a Bahrain GP in which he ignored team orders to leapfrog the slower Vettel, Sunday’s mini tantrum showed that in Leclerc, Ferrari have a driver with a healthy dose of fighting spirit. Now they just need to let him fight… If not for Leclerc, if not for the Constructors’ title, then do it for the fans. Please!